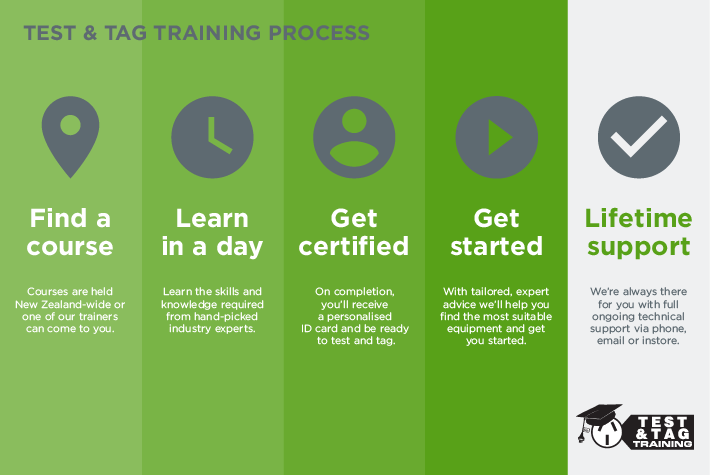 Test and Tag Training is New Zealand's industry leader at providing training of the highest possible standard, along with lifetime technical support once you're completed. As a Registered Training Organisation, all of our courses comply with the Standards AS/NZS 3760 and they'll ensure you or your employees are completely ready to test and tag. Our Test & Tag Training process will guarantee your supported every step of the way. This course has been designed to give you all the skills and competency required to begin testing and tagging, while also meeting the requirements of the New Zealand Standards. It has been completed by individuals, large corporations and hundreds of small-medium sized businesses. On the day you'll be provided with everything you need, which includes a manual, pen, notepad and equipment to use (you can also bring your own portable appliance tester). Once you complete this course, you won't need to complete any kind of refresher course, as this course will equip you for life. You will be taught in a small-sized class (strict maximum of 12 students) by an experienced test and tag industry specialist. This will ensure you have an interactive learning experience and given all the help you need (watch our video on what to expect). The course comprises of both theory and practical, but it does focus heavily on practical hands-on work to ensure you're completely ready to test and tag on your own. Test and Tag Training will teach you how to use the latest and most popular Portable Appliance Testers on the New Zealand and Australian market.